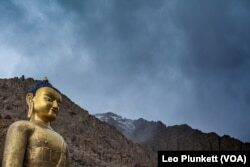 Leh, one of the two districts that make up the region of Ladakh, is a stronghold of Buddhist culture in India. The Indian region of Ladakh, in Jammu & Kashmir province, lives in the popular imagination as a Buddhist kingdom of monasteries, cloud-ringed palaces, and prayer wheels. But the diverse territory, once at the heart of the Silk Road, is just about evenly split between Buddhists and Muslims today: about 46 percent Muslim and 40 percent Buddhist. In recent years, the multiethnic community has developed fissures. The Ladakh Buddhist Association (LBA) has adopted a rhetorical line that echoes hardline Buddhists in Sri Lanka and Myanmar: they claim their identity is under siege, that they are being outnumbered by Muslims, and that Muslims are “luring” Buddhist women into marriage and conversion. The communal tensions boiled over last fall when an interfaith marriage between two Ladakhis, one Buddhist and one Muslim, stirred up a vigorous protest from the LBA and made national headlines. The dust has since settled and that couple is happily married, but the affair has exposed the deepening religious fault lines in the Himalayan foothills. Ladakh has a centuries-long history of not just peaceful cohabitation between ethnic groups, but also intermarriage itself. For instance, the 16th century Ladakhi Buddhist King Jamyang Namgyal married Gyal Khatun, a Balti Shia Muslim Princess, spurring an influx of Baltis who continue to live in Ladakh today. A Buddha statue overlooks Hemis Gompa, the largest monastery in Ladakh. In recent decades, the once-sequestered province has opened up to India at-large both literally, through improved infrastructure, and figuratively, through the free flow of the Internet and ideas. So as interfaith tensions have escalated in India, interfaith marriages have become freshly disputed in Ladakh. The notion of “love jihad” the fear in some Hindu groups that Muslim men actively court and convert their community's women, is now a key part of Ladakhi Buddhist discourse. The Next Hardline Buddhist Group? If you’re born in Ladakh to Buddhist parents, you are automatically a member of LBA. The organization was founded in 1933 to preserve Buddhist culture and provide social services for Buddhists. But it also has a hardline streak, periodically stoking communal tensions between Buddhists and Muslims. From 1989 to 1992, for instance, LBA called for an economic boycott of area Muslims. According to many Ladakhis, LBA’s tactics and hardline rhetoric have increased in recent years. “When I was dating my now-husband a few years ago, we went to have a picnic on a sunny day and LBA members, including a monk, trailed and harassed us and then called my parents,” said Rinchen, a Buddhist woman who lives in Leh and currently works with government child services. “It’s crazy for women here!” she said. LBA also harassed Stanzin Saldon when she secretly married her Muslim husband last year, contacting her family and trying to get her marriage annulled. Last month, Rinchen said a sermon at the monastery complex in Leh’s Main Bazaar that houses LBA’s offices included aggressive pro-population arguments. “They were loudly broadcasting a sermon by a monk who was totally against contraception for Buddhist women and encouraging women to have five or six children,” she said. Many LBA officials stoke fears of “Muslim overpopulation,” a common refrain in other parts of the world and a notable component of the hardline Buddhism in Myanmar that fuels the crackdown on Rohingya Muslims. Rinchen said it is “incredibly hard” for Buddhist women to get an abortion in Ladakh today. As the demographics of Ladakh have shifted (for instance, the percent of Leh district that is Buddhist has decreased from 85% to 66% in the last three decades), it has fueled the “under-siege” rhetoric of LBA. Members of both the Buddhist and Muslim establishments in Ladakh stated that interfaith marriage is generally undesirable. 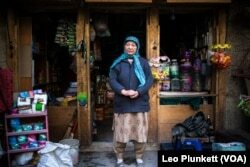 Syada Bano, a shopkeeper in Leh, said she converted to Islam when she got married at age 16 and has no regrets. Interfaith marriages are "the main root of communal tension" according to PT Kungang, the vice president of LBA and "not generally a good thing," per Ashraf Ali Barcha, the head of Anjuman Imamia, a local Shia organization. LBA’s personal attacks have been largely toothless: their agitation over Stanzin and Murtaza’s marriage, for instance, amounted to nothing, since no laws had been broken. But in a larger sense, LBA has had an outsized cultural imprint. The difficulty of obtaining abortions is one example, as is growing reluctance among Buddhists to patronize Muslim businesses. Reporting for this story was made possible by the International Reporting Project.